The config page allows you to configure your Interlok container in an easy to use graphically way. Basically, it's a UI way of editing the adapter.xml that controls how the Interlok container behaves. 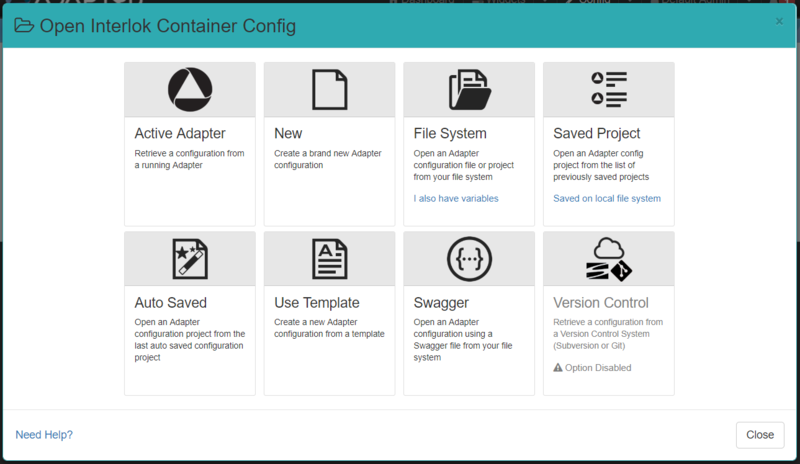 Using this page, you can apply changes to your running container; you can add, edit and delete components such as consumers, producers, services, etc. The UI application will also validate your changes, show you inline help during your editing and allows you to insert components from pre-defined templates. To navigate to the config page, you use the config button from the top navigation bar. By default the config page will open the active Adapter if only one is configured in the application. 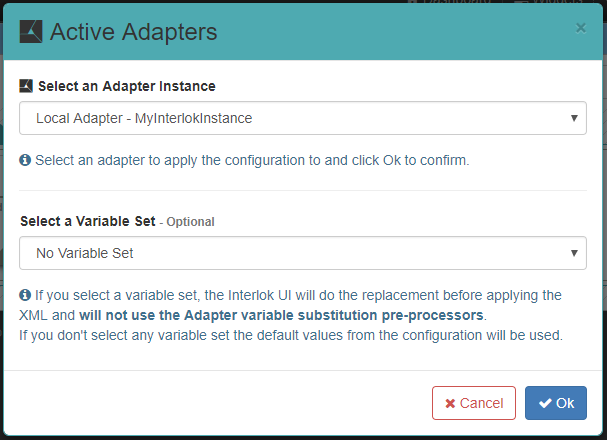 You can also open Adapter configurations from diverse sources. Just click on the Open Config button and that will open a modal displaying several options. Active Adapter: Retrieve a configuration from a running Adapter configured in the application. 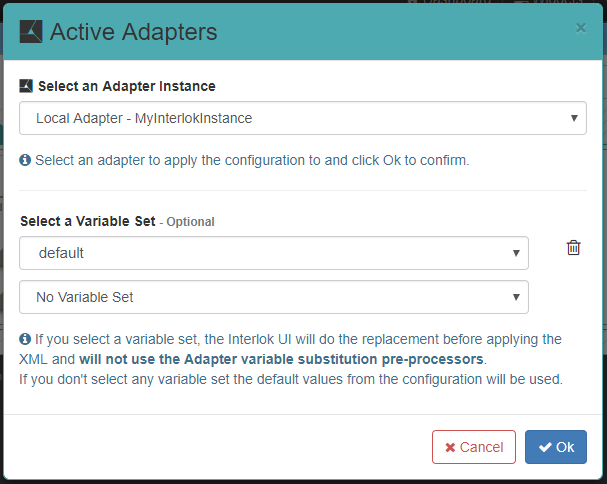 New: Create a brand new Adapter configuration. Saved Project: Open an Adapter configuration project from the list of previously saved configuration projects. If the UI is run and accessed on localhost you will also see the link Saved on local file system which allows you to open an Interlok config project from your file system. 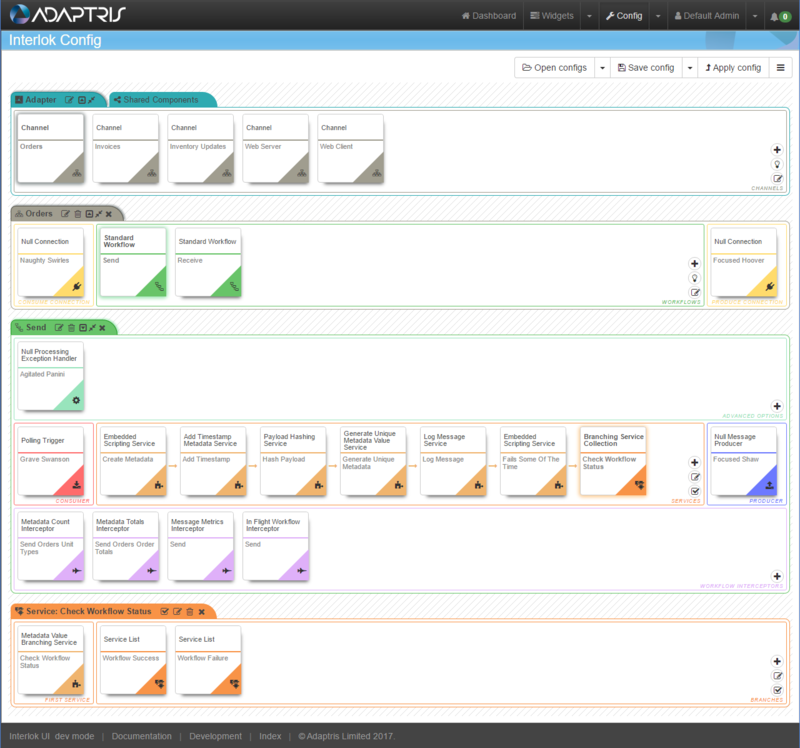 The UI will prompt you to enter the local path of the project. 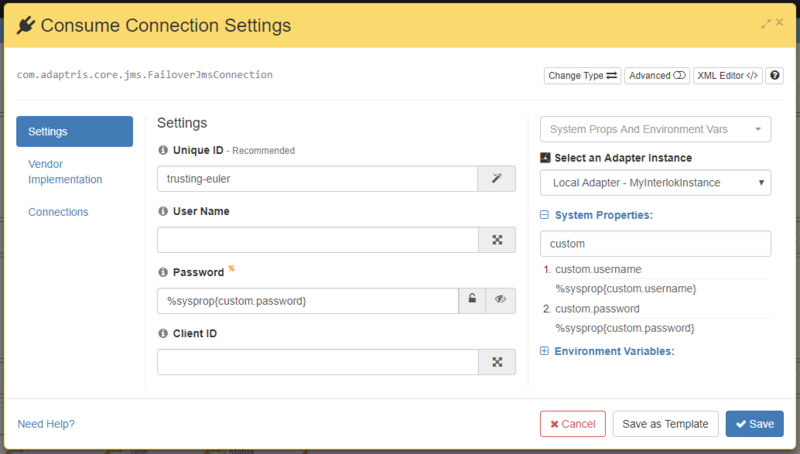 Auto Saved: Open an Adapter configuration from the last auto saved configuration. Use Template: Create a new Adapter configuration from a template. Version Control: Retrieve a configuration from a Version Control System (Subversion or Git). For this option to be enabled VCS needs to be configured and you need at least one VCS Profile. Note: When using File System: with a zip file, the zip file need to be built with the Config Project Format with a config-project.json file. Or alternatively with an adapter.xml in the zip root and optionally a variables substitution file called variables.properties can be added. This action bar is concerned with the (whole) config actions, such as opening a saved config, uploading a config file from your own store, and creating a new config file. This bar allows you to interact with the Interlok container; Select a channel; Add a channel; edit the container advanced options; edit the root settings for the Adapter object. You can add a connection or a service into the shared connection or shared service area and this connection will automatically becomes a shared one. 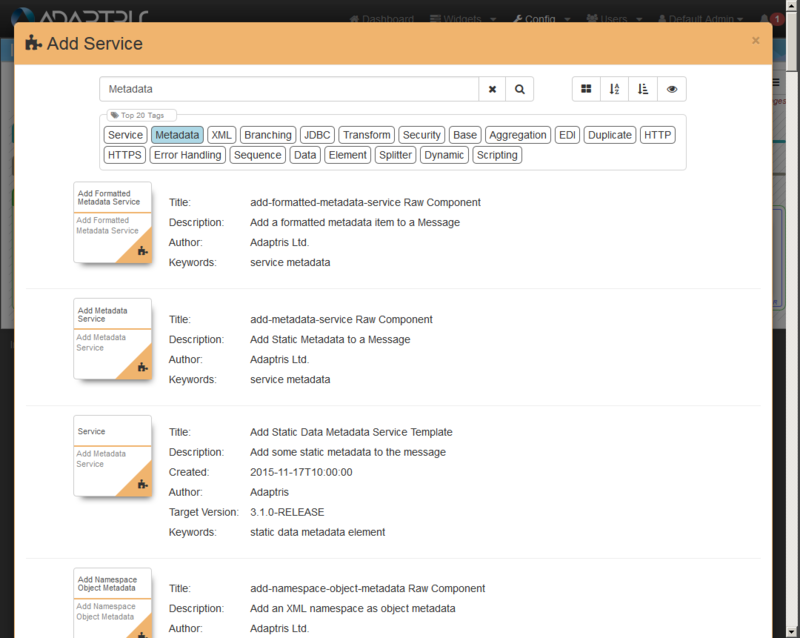 You will be able to use shared components where appropriate by selecting it from the “Existing Shared Components” list. 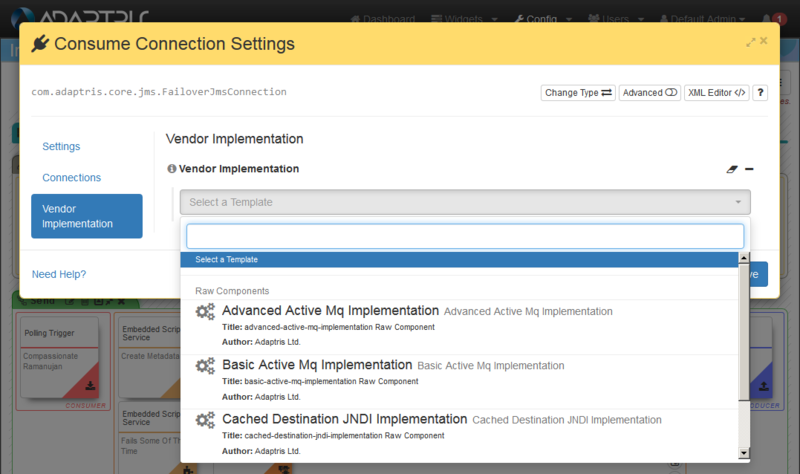 By clicking on the toggle button in the container title bar you will reveal the advanced extensions area. This area covers all your channel interaction requirements, from here, you can edit the channel settings, add workflows, select a workflow, etc. This area covers all your workflow interaction requirements, this area allows you to edit the workflow settings, add/edit/delete/re-order services etc. Component type: This example is a com.adaptris.core.NullConnection, so the component type is a ‘Null Connection’. Component type icon: As this example is a connection, the connection icon is show. Id: This would display the contents of the ‘Unique ID’ setting for that component. Edit: Clicking this would display the settings editor for this component. Replace: Pressing this would perform a remove & add function, therefore allowing you to easily replace this component. In this example, pressing this would show the add connection modal window. Remove: Activating this function would remove the component from the configuration, i.e. deleting this connection. Copy: You can use this function to copy this component to the pages clipboard. You can hold 1 of each component type in the clipboard, which can then be used to Paste it to a given applicable area. Cut: As copy, but on a Paste command, this would remove the source component. To delete a given component, you would click on the trash can icon that’s either in the header bar of that components area or if you hover over a given component it will present itself. Clicking on the trash can would therefore remove that component from the config. To add a given component, you would click on the plus icon , this will present itself when you hover over a list component, such as the channel list, workflow list, service list, etc. When adding a component, after clicking the plus icon, you’ll be presented with the add component modal window. When the add component window opens, it always shows you the initial choice of ‘folders’, these are ‘Raw components’ or ‘Templates’. As their name suggests, the ‘Raw components’ folder contains a list of available components for that list, and selecting a component from this folder will add a component to the list with default settings configuring within it. The ‘Templates’ folder contains components that you have previously saved, using the ‘Save as template’ feature on the settings editor. You’ll notice that the window has a search input that can be used to filter components. This search can be used from the folder view (i.e. you don’t have to click raw compoennts and then search). Tip: Searching from the root folder with show you results from both the raw components folder and the templates folder. To actually add the component, all you have to do is click on the required compoent and it will add it to the list you selected and show you the settings editor for that new component. Tip: When adding a service if you double click on the plus button the service will be added at the beginning of the service list. 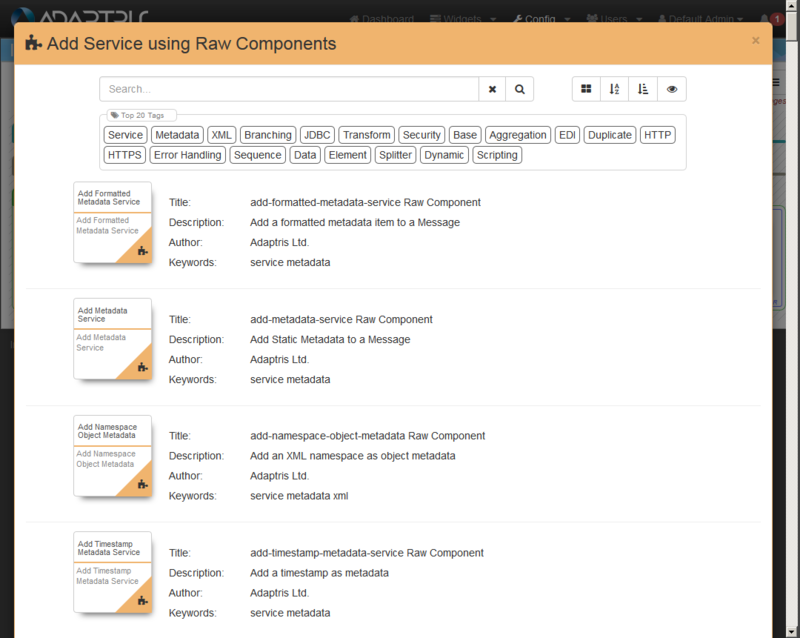 Note: From 3.6.6 you can also add new component using the Config page sidebar component. To apply the current config to a running adapter you will simply need to click on the Apply Config button from the header action bar. 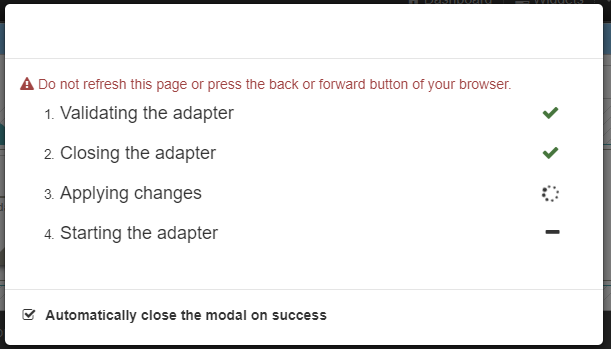 This will open a modal where you can select which adapter you want to apply the config to and, optionally, which variable set you want to use for this adapter. You can also apply the config with multiple variable sets. When more than one variable set have the same property the latest will take precedence. Then you just need to click on Ok and the apply process will start. Another modal will be displayed to show you the status of each step of the apply process. If there is any error during the process they will be displayed in the main page. The settings editor is available when you want to edit a component. This is always available by clicking on the edit icon . This editor allows you to edit the settings on a given component. You will notice that there is a input control per field for that given component. Next to the field name, there is an info icon, which if you hover over this, that fields javadoc part with show. As well as the inline help, if you click on the info icon that’s in the settings editor header, this will open a new browser window with that component type javadoc. This will allow you to select a given implementation for that field, this is handy if you need to select an error handler type for example. As well as string, number and boolean inputs, there are special inputs for SQL, XML, Script, etc, that allow better editting of those values. As well as allowing you to easily edit the values of a component, if you do want to switch to the advanced XML config mode, then you would press the XML icon in the editors header . Full Java Class Name: This is the full java package & class name of the component that is being edited. Base/Root Settings: Each component is made up of its settings and its inner components, so this ‘tab’ will show the root settings for this compoenent. Inner Components: There would typically be a ‘tab’ per inner component. This example shows that outside the root settings, we have connections, and a vender implentation. Setting Name & Setting Input: Each of the components settings (and inner components settings) will have a list of configurable fields, made up of the setting label and the setting value. Javadoc popover trigger: Hovering over this icon with your mouse will show that fields javadoc part. Encode password: This is a password only feature, but ticking this would encode that feilds value in the XML. Expand input: Each text input will have the option to expand the input from a single line to a text area (for multiple line input). 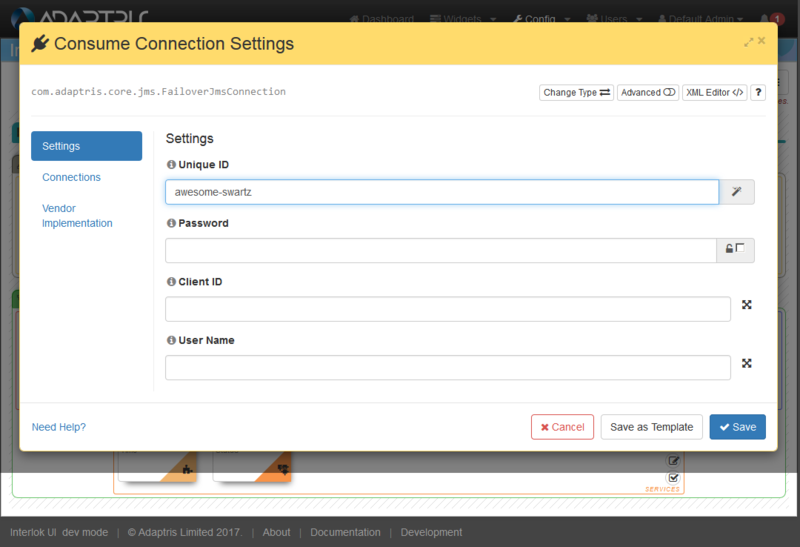 Change connection type: This button allows you to switch the component type, for example if you had a FTP Connection, you could switch types to a JMS Connection (or any other connection). This feature will change the base type of the component and attempt to copy any matching field values. Expand window: Clicking this will toggle the settings editor window size. Toggle Advanced View: Switching on the advanced view shows all the fields for the given component including all those fields that can be safely left to their defaults. Save and close: Save your changes and close the editor. 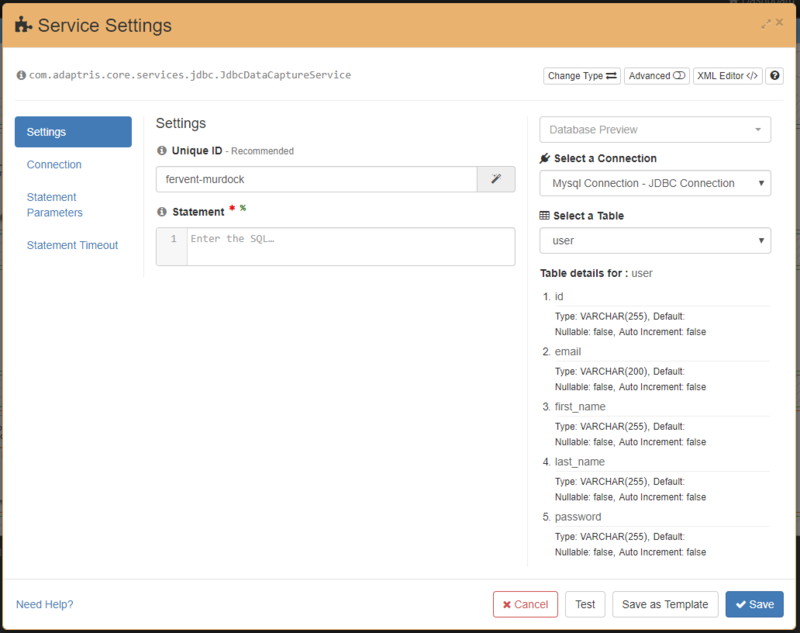 Create Template: Create a template from this configured component, which will then be shown as a choice during the add component feature. Since 3.7.0 you can use the sidebar to encode some setting values using the URL Encoder. 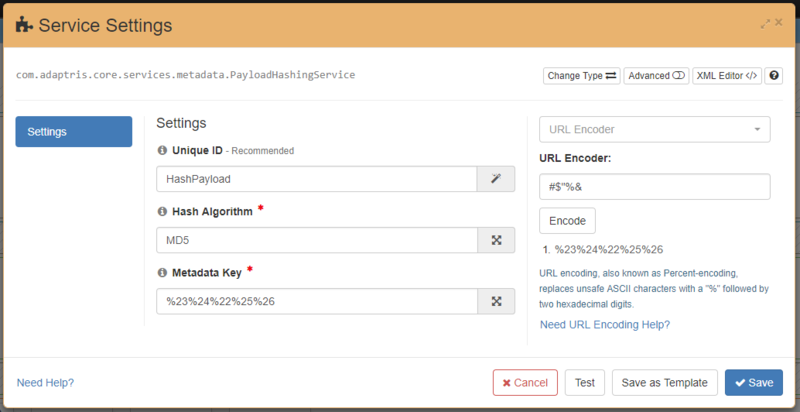 To do that, select URL Encoder in the sidebar dropdown, enter the value you want to encode and click on the Encode button. The sidebar keep an history of the last ten encoded values while you stay on the config page. You can drag and drop the encoded values to any text input on a similar way as with the Metadata Preview and the Most Occurrences shown in the video above. Since 3.7.1 you can use the sidebar to retrieve system properties for the selected running adapter. You can drag and drop the system properties in the text field which allow External (System Propertiess, Environment Variables), they are marked with the orange ‘%’. Since 3.7.2 you can use the sidebar to connect to a database using a configured connection and retrieve the list of tables and their columns details. You can drag and drop the table and column names in text fields. These service lists wouldn’t be shown in the settings editor. Instead they are selectable by clicking on the service collection selector icon on the component visible on hover (see above). This then brings up a service collection area which can be operated on in the same manner as the workflows service list area. 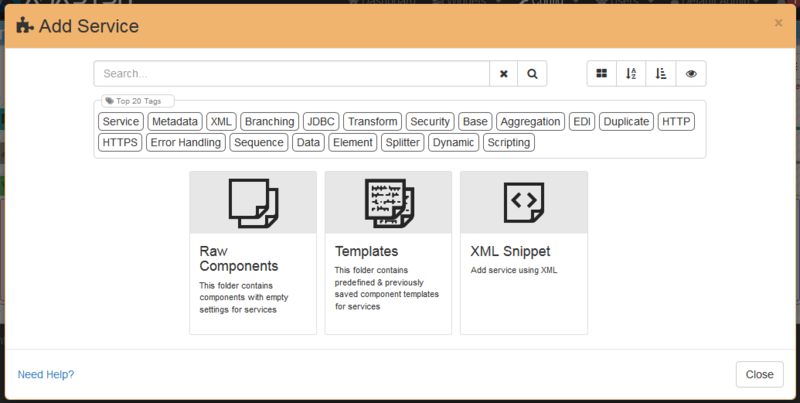 Services, service collections and connections are the only components in the config page which can be drag and drop. Drag and drop a service in the same service collections will re-order the service. 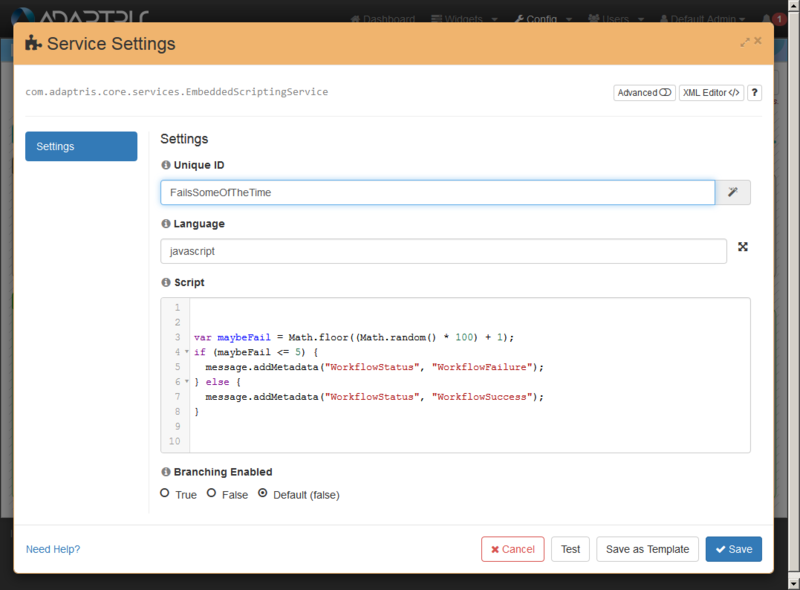 Drag and drop a service in a different service collection will move the service to a different service collection. Drag and drop a service from a service collection to the shared service collection will create a new shared service in the shared components and use this new shared service in the original service collection. Drag and drop a service from the shared service collection to any other service collection will add the shared service to the *service collection. Drag and drop a connection from a channel connection area to the shared connection collection will create a new shared connection in the shared components and use this new shared connection in the original channel connection area. Drag and drop a connection from the shared connection collection to any channel connection area will add the shared connection to the *channel connection area.